University Of Iowa Press, 9781609383831, 198pp. Night in Erg Chebbi and Other Stories spans the globe, taking us from Belfast to Brazil, Morocco to Manhattan. The teenaged daughter of an IRA assassin flees Northern Ireland only to end up in Baby Doc’s terrifying Haiti. An American woman who’s betrayed her brother only to lose him to a Taliban bullet comes face to face with her demons during a vacation in Morocco. A famed photojournalist must find a way to bring her life’s work to closure before she goes blind, a quest that changes her understanding of the very physics of light. 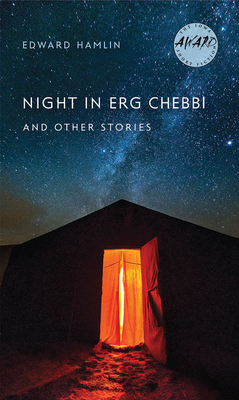 By turns innocent and canny, the characters of Night in Erg Chebbi and Other Stories must learn to improvise—quickly—when confronted with stark choices they never dreamed they’d have to make. Lyrical, immaculately constructed and deeply felt, these nine stories take us far beyond our comfort zones and deep into the wilds of the human heart. Edward Hamlin’s work has appeared in numerous literary journals and on stage. He was the winner of the 2013 Nelligan Prize for Short Fiction. A New York native, Hamlin spent his formative years in Chicago, and now makes his home in Boulder, Colorado.